Chaplain Graeme Ramsden served in Vietnam as a soldier and subsequently studied theology and was ordained as a deacon of the Roman Catholic Church. He commenced duties as a chaplain in the Australian Regular Army and was deployed on operations to support the Joint Support Unit with the international force in East Timor (INTERFET). 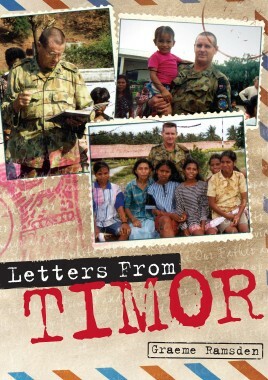 Letters from Timor is his personal and moving account of his deployment and a unique perspective of Australian Military Operations. Chaplain Graeme Ramsden served in Vietnam as a soldier with the Royal Australian Electrical and Mechanical Engineer Corps in 1968-69. In 1976, he was commissioned and served as a quartermaster, officer commanding a workshop and, as an instructor at the Land Warfare Centre. In 1990, he undertook theological studies and was ordained as a deacon of the Roman Catholic Church and developed a wide pastoral experience with the church. In 1993, he commenced duties as a chaplain in the Australian Regular Army. In 1999 he deployed on operations to support the Joint Support Unit with the international force in East Timor (INTERFET). During the deployment, he was also appointed Deputy Senior Chaplain for the mission.